Following the United States extending its deadline to raise tariffs on Chinese products and increased optimism that the two biggest economies are well on track to reach an agreement, outlook in the markets has clearly turned for the better. Because of this, China’s Shanghai Composite Index jumped 5.6 percent within a single trading day on 25 February 2019. Along with the rise of the Chinese markets, the local bourse also saw its benchmark Straits Times Index registering a year-to-date return of 3.9 percent. In the last two months, we noticed three stocks which had good run-ups achieving double-digit growth in their share prices. As investment guru Warren Buffett had pointed out, “be fearful when others are greedy”. While we cannot say for sure if these three stocks may continue to run, we think that it might be a good idea to probably take some profits off the table. Thai Beverage Public Company’s (ThaiBev) share price surged more than 34.4 percent when it closed at $0.82 a share on 18 February 2019 from $0.61 on the first trading day of the year. 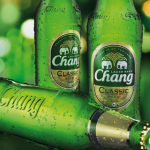 The group’s 1Q19 revenue jumped 59.7 percent to 72.6 billion Baht driven by significant increase in sales from both its spirits and beer businesses. Correspondingly, net profit more than doubled to 7.4 billion Baht because of the better performances of its core segments as well as the absence of one-time expenses relating to business acquisition. Excluding one-off, net profit grew 36.9 percent from 5.4 billion Baht a year ago. Going forward, the domestic beverage market looks set to embark on the route to recovery on the back of private consumption pick-up underpinned by an improvement in farmers’ income and rising consumer purchasing power. Furthermore, pre-election campaigns ahead of the coming election in March 2019 as well as the Songkran festival in April are also additional catalysts to stimulate ThaiBev’s sales. While ThaiBev’s strong set of quarter results have restored investors’ confidence in the group’s near term performances, current valuations appear a little rich with price-to-earnings (P/E) and price-to-book (P/B) ratios standing at 20.3 times and 3.7 times respectively, based on its last trading price of $0.795 as at 11 March 2019. 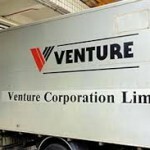 Venture Corporation’s (Venture) share price climbed to $19.23 on 6 March 2019, jumping 36.6 percent from opening at $14.08 on 2 January 2019. Venture’s FY18 revenue slid 13 percent to $3.5 billion attributable to the impact arising from clients’ product transitions. However, net profit dipped only by a marginal 0.7 percent to $370.1 million after taking into account the absence of a non-recurring gain from the disposal of an investment in associate. Excluding one-off, net profit would have registered a 2.4 percent increment year-on-year. Despite headwinds against the group’s top-line, Venture managed to sustain its profitability by enhancing value creation through engineering design, R&D capabilities and operational excellence across several technology domains. Venture’s strong profitability is also reflective of its superior margins as a result of prudent cost management. For the period FY18, net profit margin improved by 1.3 percentage points to 10.6 percent. Moving forward, Venture’s next phase of growth will mainly be driven by new product launches and expansions into new markets leveraging on its success in value creation within its clusters of excellence. As at 31 December 2018, Venture’s net cash position remained strong at $711 million with $712.8 million of cash and bank balances against $1.8 million of borrowings. The group declared a final dividend of $0.50 which together with $0.20 of interim dividend that had already being paid, brought full year payout to $0.70 a share. This also marked the second consecutive year of dividend growth as Venture has been distributing a stable dividend of $0.50 a year prior to FY17. Despite the dividend increase in FY18, Venture’s share price of $18.26 as at 11 March 2019 implies a much lower yield of 3.8 percent because of its recent rally. As the US Federal Reserve paused its rate hike, interests from yield-seekers are flowing back into the REITs once again. 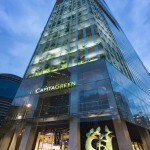 Consequently, CapitaLand Commercial Trust’s (CapitaCom) share price jumped 11.9 percent closing at $1.97 on 7 March 2019 from its closing price of $1.76 on 2 January 2019. The group’s gross revenue rose 16.7 percent in FY18 to $394 million with contributions from Asia Square Tower 2 and Gallileo acquired in November 2017 and June2018 respectively. In line with the higher revenue, net property income also grew 18.5 percent to $314.6 million. Based on data from CBRE Research, Singapore’s average monthly Grade A office market rent climbed 14.9 percent to $10.80 per square foot in 4Q18. Given the relatively lower new supply completion in the coming few years, analysts are generally expecting Grade A office market rent to continue trending upwards. As at end-December 2018, CapitaCom’s portfolio occupancy was robust standing at 99.4 percent. While CapitaCom’s distribution per unit inched up 0.5 percent in FY18 to $0.087 a unit, current yield dropped to 4.5 percent based on the group’s last market price of $1.94 a share as at 11 March 2019. This makes it less attractive in comparison to other commercial REITs such as Frasers Commercial Trust and OUE Commercial REIT which offered distribution yields of 6.5 percent and 7 percent respectively. In addition, CapitaCom’s P/B ratio currently stands at 1.1 times with a net asset value (NAV) of $1.80 per share while both the other two REITs mentioned are still trading below their respective NAV.